Our venerable and God-bearing Father John Climacus (ca. 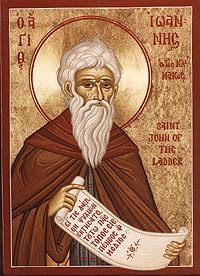 579 - 649), also known as John of the Ladder, John Scholasticus, and John Sinaites, was a seventh century monk at St. Catherine's monastery at the base of Mount Sinai. In Greek, his epithet is Κλιμακος (Klimakos). The Orthodox Church celebrates his feast day on March 30. He came to the monastery and became a novice when he was about 16 years old, and when he died in 649 he was the monastery's abbot. He wrote a number of instructive books, the most famous of which is The Ladder of Divine Ascent. (It is because of this book that John is known as "Climacus," which means "of the ladder".) It describes how to raise one's soul to God, as if on a ladder. This book is one of the most widely read among Eastern Orthodox Christians, especially during the season of Great Lent which immediately precedes Pascha (Easter), and on the fourth Sunday of Great Lent he is especially commemorated. "Nothing equals or excels God's mercies. Therefore, he who despairs is committing suicide. A sign of true repentance is the acknowledgment that we deserve all the afflictions, visible and invisible, that come upon us, and ever greater ones. Moses, after seeing God in the bush, returned again to Egypt, that is, to darkness and to the brick-making of Pharaoh, who was symbolical of the spiritual Pharaoh. But he went back again to the bush, and not only to the bush, but also up the mountain. Whoever has known divine vision will never despair of himself. Job became a beggar, but he became twice as rich again." "Repentance is the renewal of baptism. Repentance is a contract with God for a second life. A penitent is a buyer of humility. Repentance is constant distrust of bodily comfort. Repentance is self-condemning reflection, and carefree self-care. Repentance is the daughter of hope and the renunciation of despair. A penitent is an undisgraced convict. Repentance is reconciliation with the Lord by the practice of good deeds contrary to the sins. Repentance is purification of conscience. Repentance is the voluntary endurance of all afflictions. A penitent is the inflicter of his own punishments. Repentance is a mighty persecution of the stomach, and a striking of the soul into vigorous awareness." "Let us charge into the good fight with joy and love without being afraid of our enemies. Though unseen themselves, they can look at the face of our soul, and if they see it altered by fear, they take up arms against us all the more fiercely. For the cunning creatures have observed that we are scared. So let us take up arms against them courageously. No one will fight with a resolute fighter." "He who really keeps account of his actions considers as lost every day in which he does not mourn, whatever good he may have done in it." "I consider those fallen mourners more blessed than those who have not fallen and are not mourning over themselves; because as a result of their fall, they have risen by a sure resurrection." "But Adam did not wish to say, "I sinned," but said rather the contrary of this and placed the blame for the transgression upon God Who created everything "very good," saying to Him, "The woman whom Thou gavest to be with me, she gave me of the tree and I ate." And after him she also placed the blame upon the serpent, and they did not wish at all to repent and, falling down before the Lord God, beg forgiveness of Him. For this, God banished them from Paradise, as from a royal palace, to live in this world as exiles. At that time also He decreed that a flaming sword should be turned and should guard the entrance into Paradise. And God did not curse Paradise, since it was the image of the future unending life of the eternal Kingdom of Heaven. If it were not for this reason, it would have been fitting to curse it most of all, since within it was performed the transgression of Adam. But God did not do this, but cursed only the whole rest of the earth, which also was corrupt and brought forth everything by itself; and this was in order that Adam might not have any longer a life free from exhausting labors and sweat..."
To sweeten the hearts of those who receive them with attention. Leading the souls of those who honor you from earth to Eternal glory in Heaven! This page was last edited on October 22, 2012, at 19:17. This page has been accessed 61,976 times.